The city of Cleveland Heights was created in 1901 and became my home a little over two years ago. When I heard NEO Food Tours was going to tour the Cedar-Lee District I bought one of the first tickets. I looked forward to possibly trying some new restaurants and getting to know my ‘hood a little better. Unfortunately they had to cancel the tour last year, so I was out of luck. I was happy to see they were going to offer the tour again on August 28th. This year’s tour didn’t really feature any restaurants that I haven’t been to yet, but then again I have lived in the Heights for a while now. It was nice to enjoy some favorites I hadn’t been to in a while and visit a couple places I wasn’t quite as familiar with. So after enjoying a nice day off I made my way to Cedar and Lee on Tuesday night, parking for free on Meadowbrook. The tour started at Lopez on Lee. We checked in at the bar and were greeted by Todd Gauman, head of NEO Food Tours, and Cleveland Heights mayor Ed Kelley. My car had been broken into the week before (I leave it unlocked to avoid replacing a window and leave absolutely nothing of value in it), and we talked about that and other topics for a bit. I enjoyed chatting with him and was thrilled when he chose to sit next to me. He is a really nice guy. He told us about some of the upcoming plans for the Cedar-Lee district, including a multi-million dollar housing and retail project at the corner of Meadowbrook and Lee Roads. Lopez is known for its Mexican cuisine, and we were all served margaritas and bags of chips and homemade salsa as we sat. 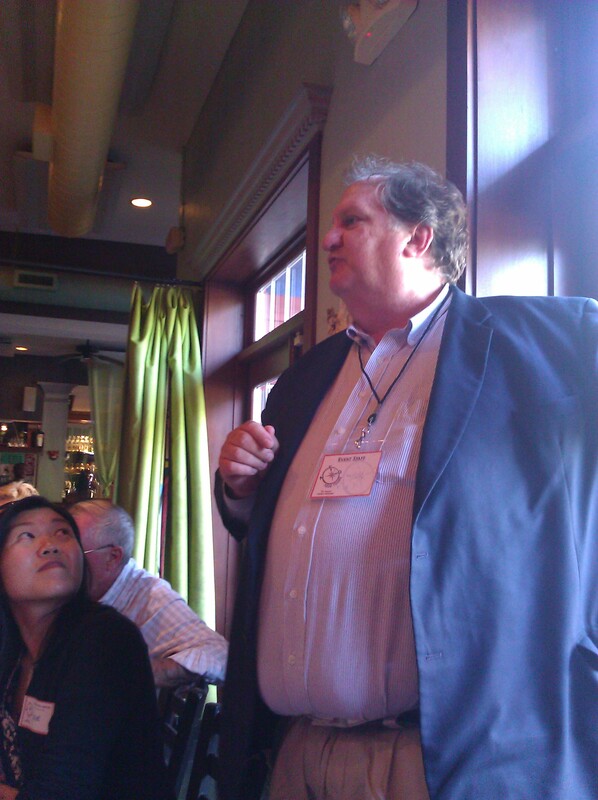 The executive chef, Michael J. Herschman, greeted us and told us a little bit about Lopez. Turns out Rick Bayless was the first chef at Lopez. Rick hosts a series on PBS and is a regular on the Food Network, so that was a very cool piece of trivia. 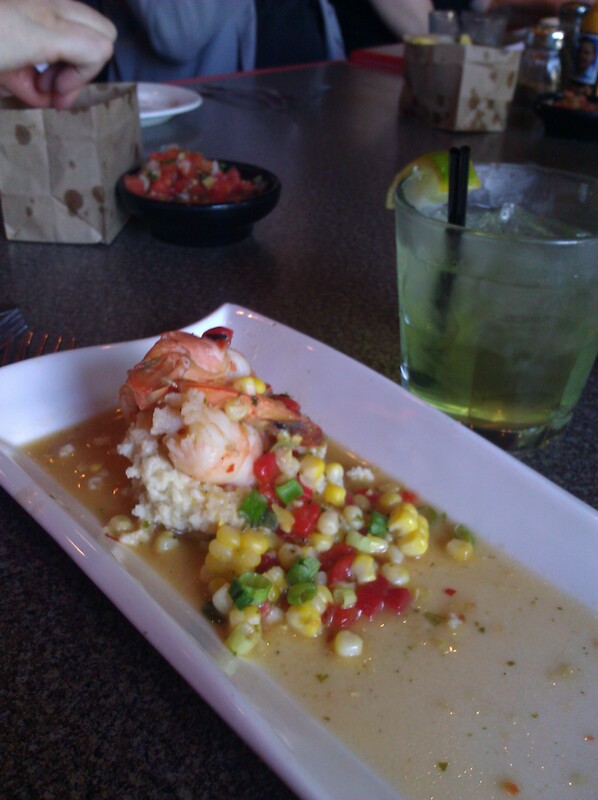 As we listened to the history of Lopez and their dedication to using local produce, we noshed on their shrimp and grits featuring corn and chile grits with smoked cheese, roasted peppers and scallion. It had a nice heat to it thanks the jalapenos and chiles in the grits and sauce. 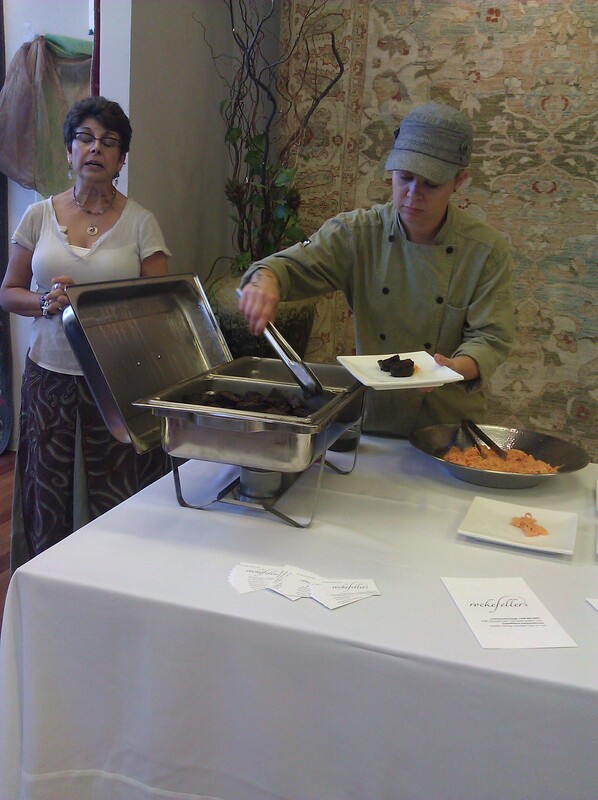 We then walked down to Abrash Gallery that featured a pop-up by Rockefeller’s Restaurant and Lounge chef Jill Vedaa. Chef Vedaa and the owner of Abrash Gallery briefly talked about their respective establishments. Abrash Gallery features handmade rugs and other fair trade goods for sale. Rockefeller’s is located on the second floor of the Heights Rockefeller Building at the corner of Lee and Mayfield, which was built by John D. Rockefeller Junior in 1930. I’ve always loved the building and secretly hoped to live near the building and Fairmount, which I now do. Rockefeller’s is located in the former site of a bank. Chef Vedaa prepared short ribs over a bed of shredded carrots (sorry but I don’t remember how the carrots were prepared, but they were good!). 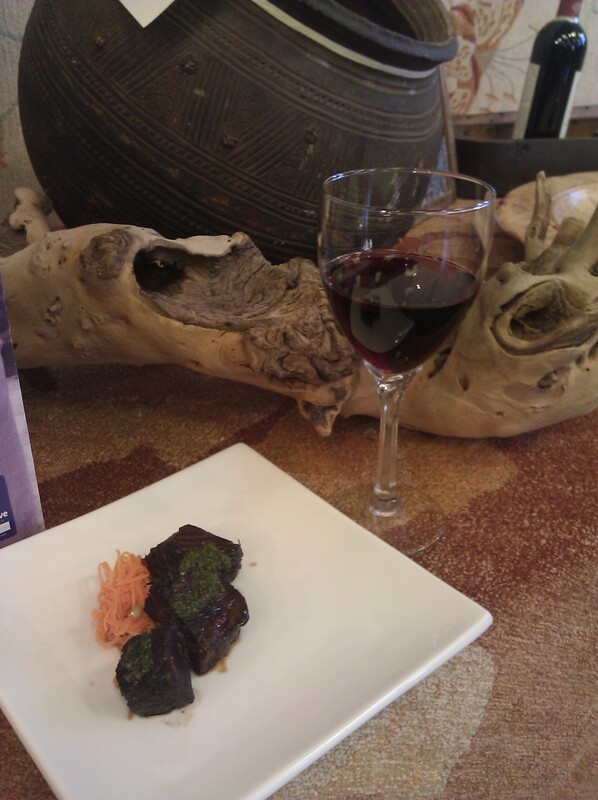 Since we were in a gallery that didn’t offer the ability to sit or use a knife , the short ribs were a good choice. They just fell apart with the touch of the fork. She served a pinot noir to accompany the short ribs. It was a very successful pairing. I was happy to find a seat in front of a fan, because it was quite warm in the gallery. We then crossed the street and headed on down to The Wine Spot, where we were greeted by owners and a representative from FarmShare Ohio. 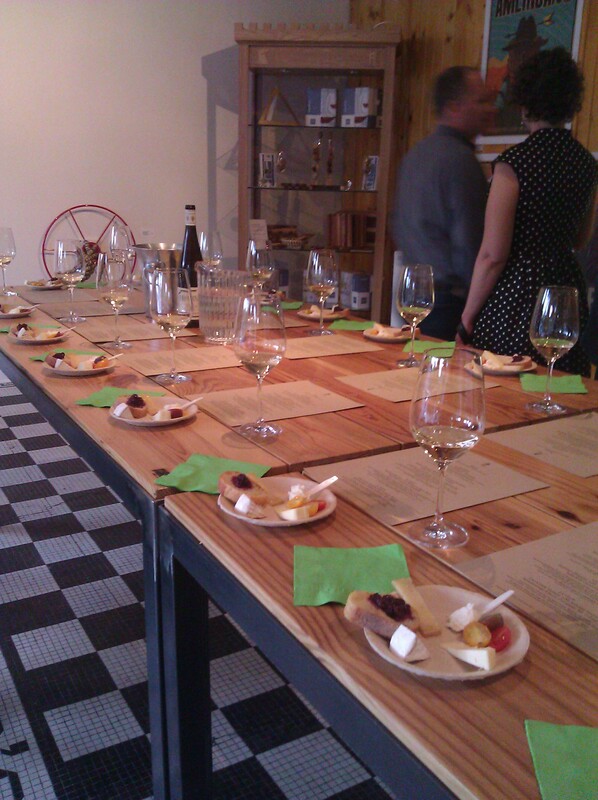 The long table covered in plates featuring local cheeses and wine glasses was quite pleasing to the eye. The cheese plate was accompanied by a handy guide. The 12 o’clock position featured fresh chèvre (goat’s milk) from Lake Erie Creamery, 3 o’clock was a basket cheese (a Guernsey cow milk cheese) with heirloom cherry tomatoes from Lake Erie Creamers, 6 o’clock was a summer blomma with blueberry aigre-doux (my favorite cheese because I’m a huge fan of camembert and brie), and 9 o’clock featured a Own Creek Tomme (a sheep’s milk cheese) from Kokoborrego Cheese Company drizzled with raw honey from Auburn Apiary. We were served 3 different wines from Ohio. I enjoyed the first two (white wines), but not the third (a pinot). I would have loved the third with a meal, but it didn’t quite pair well with the cheeses, especially following two white wines. After The Wine Spot we headed to Phoenix Coffee to sober up with a coffee tasting. The wired-up coffee expert was extremely entertaining and shared two different coffees with us prepared two different ways – in a French press and cold-brewed. 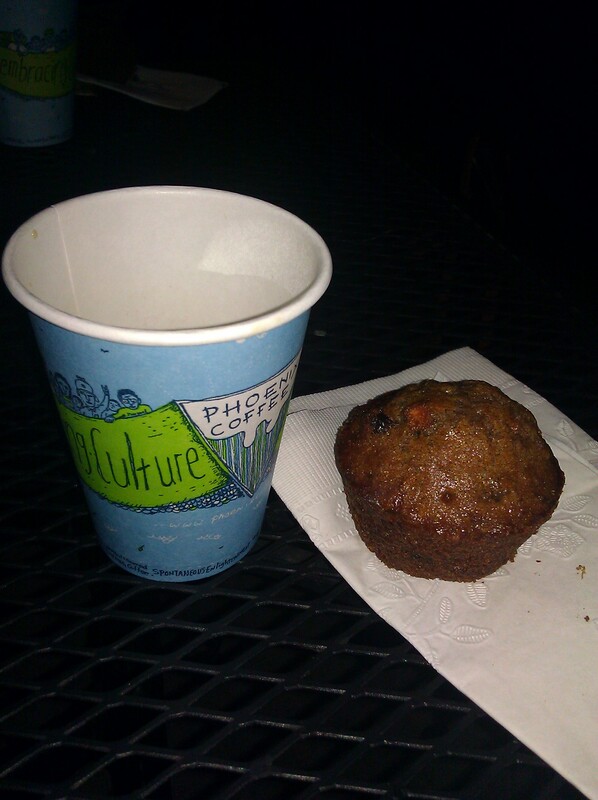 The coffee was accompanied by a bran muffin that tasted to me like a good carrot cake. Yum! He also told us about the coffees he was serving, but I’ll be darned if I can remember them. I think the first one was a direct trade coffee from Mexico and the second one was an Ethiopian coffee, but don’t quote me on that. They try to buy their coffee directly from the growers and cut out the “coyote’ middlemen who underpay the farmers for their harvest. 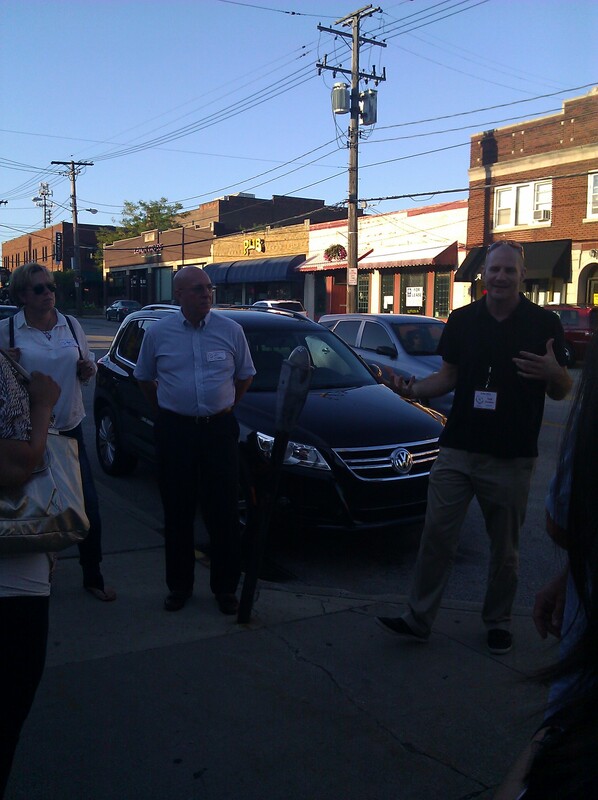 He talked about the different locations and the roastery in the heart of downtown Cleveland. He is particularly excited about an upcoming shipment of coffee in mid-September that sounded interesting (although again I can’t remember the details – just that it sounded great), so I definitely plan to stop by for a cup at my local Phoenix Coffee on Coventry. 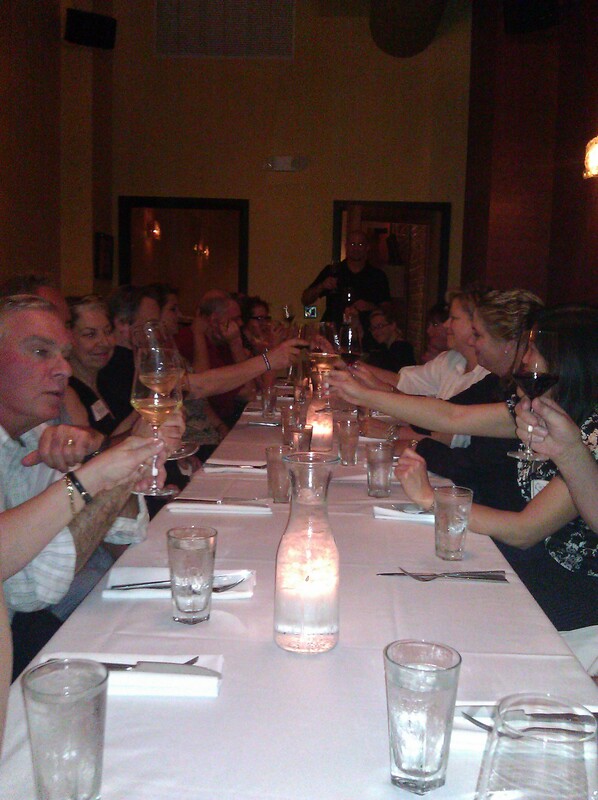 Our final stop of the night was at Taste. We walked through the dining room, past the open kitchen where we said hi to the chefs and into the private room in the back. The first thing we noticed was the gorgeous chandelier. We were told later that it was made from wine bottles and glassware from Spy Bar in the Warehouse District. And the sconces on the side walls were made from white bottles. The servers came around offering us our choice of red or white wine. I went with the pinot noir, which was delicious. Todd got a little choked up as he explained he was dedicating the tour that night to Sergio Abramof, the owner of Sergio’s and Sarava who passed away unexpectedly earlier that week, and we raised our glasses in his honor. Sergio was a force behind the independent restaurant movement here in Cleveland and a true mentor to many. He will be missed. 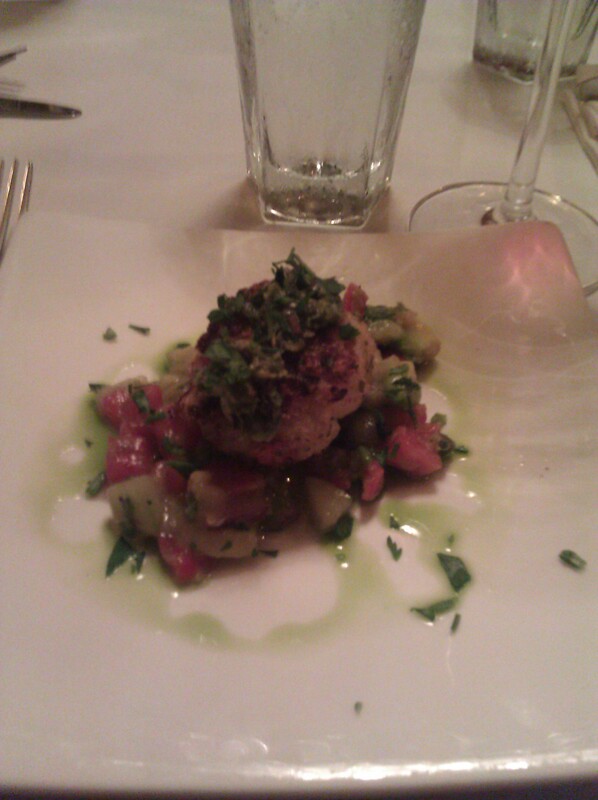 We were served a crab cake served over a bed of fresh salsa and drizzled with basil oil. The crab cake was moist and not too “fishy.” The salsa was fresh and bright, and I loved the fact that it had lots of cilantro in it. If I had known we were being served a crab cake I would have probably opted for the white wine, but my pinot did not conflict too terribly with the crab cake. We were given take-away bags with some fliers, coupons and bite-sized pastries from Coquette Patisserie. The Queen of Sheba (left) is an almond paste chocolate cake with a layer of spicy Mexican chocolate ganache (spicy chocolate? yes please…). The center pastry is a Pixie Bar, which is a pistachio florentina atop almond paste cake, a layer of lingonberry compote, and a pâte sucrée crust (my clear favorite – almond, lingonberry and pistachio – what’s not to love?). 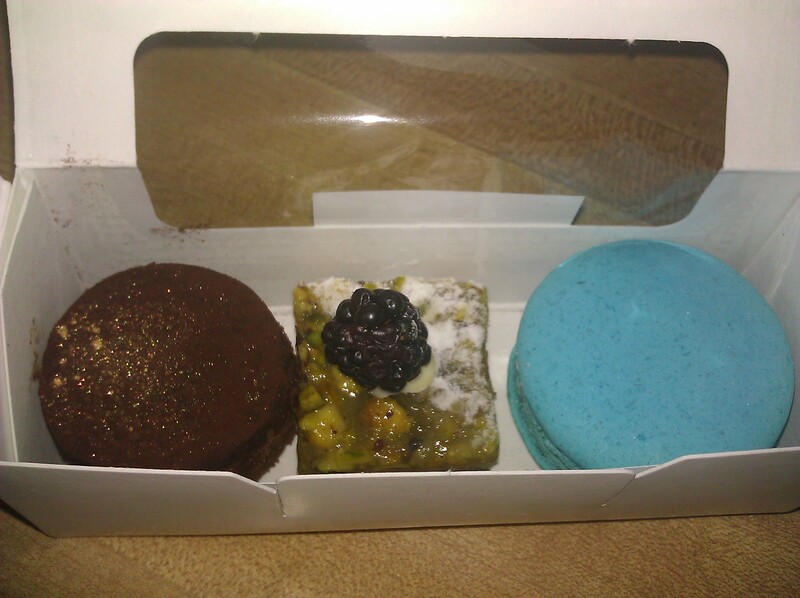 The Blueberry Macaron (right) is an almond flour meringue shell filled with blueberry buttercream and was gluten-free. The meringue shattered to reveal the buttercream, and it was very flavorful. It was with a heavy heart and stomach that we headed home at close to ten o’clock. I’m proud to report that I went right to sleep shortly after getting home from the tour and the coffee did not keep me up as I had feared it would.